Ian Inskip revisited the Islands with his wife Marianne. During their stay they saw all the ship’s Memorials that had incurred causalities during the 1982 Conflict except that of HMS Glamorgan. 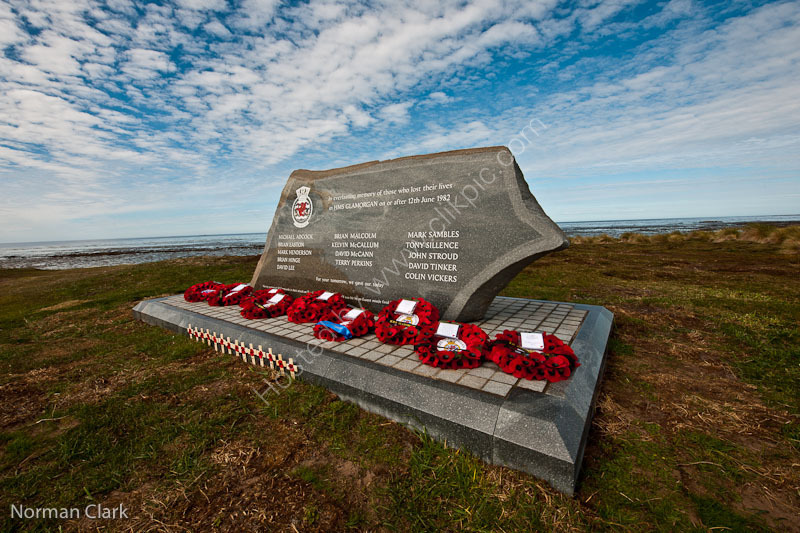 On his return to the UK he presented his case for a Memorial to HMS Glamorgan Falkland Islands Association. In the intervening years the Association raised £12,000. Architect Dewi Hughes, designed the Memorial stone. A Three Ton piece of Granite was cut by Trefor Davies at a quarry near PwIIheli. Then transported to Cerrig Ltd, where Welsh Sculptor Josh Tomas carried out the engraving. The Unveiling was attended by HE the Governor of the Falkland Islands, Nigel Haywood CVO, Commander British Forces South Atlantic, Commodore Phillip Thickness and members of the HMS Glamorgan Falkland Islands Association. Following the Dedication Service a Public Reception was held at the Falkland Islands Defence Force Headquarters.